Many colleges offer a variety of intramural sports to encourage teamwork and collaboration among students. Students participate in intramural sports for fun, practice, physical exercise, or competition. Faculty and staff often participate, as well. These recreation-based, on-campus sports teams are designed primarily for enjoyment, but teams often compete for titles, awards, and bragging rights. Intramural sports promote inclusion, acceptance, health, and wellness among students. Those who compete and those who participate in the planning and organizing of intramural sporting events often benefit from taking a break from studying, coursework, and the demands of everyday life. NIRSA is the national authority on intramural sports. Most colleges and universities in the U.S. abide by NIRSA rules and regulations to promote universal standards for on-campus teams. NIRSA helps schools across the country develop successful intramural teams. Though many schools follow NIRSA regulations, the individual characteristics in each intramural program often reflect the particular institution. Loyola University Chicago offers intramural sports in both tournament and league formats. Most programs last two to four weeks, with each team playing on the same day each week until the playoff competition. While Loyola offers men's, women's and co-rec teams, players can only play on one team per league at a time. All participants must register online through IMLeagues; signup is on a first-come, first-served basis. Loyola offers intramurals including softball, flag football, soccer, volleyball, dodgeball, badminton, water polo, basketball, and racquetball. For Harry Potter fans, Loyola even offers a Quidditch league. Men's and women's ultimate Frisbee leagues are growing, and like many other groups, ultimate Frisbee players often hold team social events after games. Group fitness classes, personal training, and aquatic workouts are also available to students, faculty, and staff. Students, faculty, and staff can participate in intramural sports at Gannon. The university promotes intramurals as a fun way to stay active and spend time with peers. Gannon provides a positive atmosphere in which students feel comfortable to explore healthy ways of improving their social skills, physical abilities, and mental aptitude. The university's Department of Intramural and Recreational Sports offers a variety of sports, sometimes up to 20 options, including volleyball, wrestling, and hockey. Gannon also offers less traditional options, such as battleship, table tennis, ultimate frisbee, and cricket. Gannon's top-notch athletic facility maximizes participants' enjoyment. Students can also download the REC*IT mobile app to keep track of Gannon's intramural schedules and live stats. The department offers championship t-shirts for each year's top teams. San Francisco State University offers a variety of leagues and tournaments through its intramural sports programs, housed in the SF State Campus Recreation Department. SF State intramural participants include students, faculty, and staff of all skill levels. Participants must register through IMLeagues to join a team; they can also obtain a pass for a one-day event or register as a free agent. SF State offers intramural sports including basketball, flag football, indoor soccer, outdoor soccer, team tennis, and volleyball. The university provides other programs to promote health and wellness, including Group X and an aquatics program. As of August 2017, SF State offers students access to the Mashouf Wellness Center, a space for physical activity, healthy habits, holistic wellness, innovation, and fellowship. Drexel University offers a variety of leagues, tournaments, one-day events, and special activities throughout the academic year. Drexel's Recreational Athletics Office organizes intramural sports offerings that promote fair play, sportsmanship, and goodwill. The Recreational Athletics Office emphasizes student development through participatory sporting events and helps students develop their social skills through teamwork. Drexel offers traditional sports including basketball and floor hockey, along with options such as billiards, squash, and ultimate Frisbee. Drexel attracts a large number of participants by frequently adding interesting sports and activities. Available leagues change each semester, so students should contact the Recreational Athletics Office for an updated list of intramural sports offerings. Students, faculty, and staff may participate in any of the leagues, tournaments, or special recreational events. Rutgers offers intramural sports programs that encourage physical activity, social networking, and personal development. Through the Division of Student Affairs, Rutgers organizes men's, women's, and coed leagues, tournaments, and special events. The university offers sports including cricket, handball, street hockey, football, soccer, and volleyball. Participants must register through IMLeagues to join a team or participate as a free agent. The intramural website offers discussion boards to help students meet and form teams. Live game updates are available on the Rutgers Facebook page, and students can download the REC*IT mobile app. Rutgers offers paid positions as student officials for intramural sports. At Heidelberg University, intramural sports are popular, and many students consider them to be an integral part of campus life. In fact, 92% of students at Heidelberg participate in extracurricular activities such as intramural sports. The university's intramural programs provide exercise and recreation while emphasizing friendly competition and sportsmanship. Heidelberg students focus more on having fun than on winning. In addition to the health benefits of regular physical activity, participants have opportunities to meet new people and build leadership skills. Available sports include basketball, dodgeball, kickball, soccer, volleyball, and golf. The university also offers nontraditional intramural leagues, including Madden XBox tournaments, bench-press competitions, and wiffleball. Additionally, Heidelberg offers one-day competitions and tournaments. Students, faculty, and staff can participate in intramural programs. To promote physical and mental wellness, Amherst offers a robust schedule of seasonal intramural sports. Amherst's spring intramural sports include softball, flag football, golf, and tennis. Popular winter sports include basketball, table tennis, and volleyball. Additional recreational activities at Amherst include intramural spelling bees, trivia teams, and lawn games, all of which are one-day, recurring events. The Amherst campus is home to more than 12 facilities that support the school's athletic activities, including a golf course, squash courts, soccer fields, a gymnasium with basketball court, baseball and softball fields, tennis courts, an ice hockey rink, and a pool. Students have access to live coverage of intramural activities, active email lists, and intramural social media accounts. All registered students and college employees can participate. Arkansas Tech University works to improve students' quality of life and to help them develop social and sportsmanship skills through a variety of structured and informal intramural teams. In spring 2018, ATU opened a new multi-sports complex on its campus. The facility offers new spaces and upgraded equipment for intramural participants. The Hall League divides students into teams based on their hall, and teams compete in Sunday matches. The Competitive League is designed for more intense participants. The top participants from the Competitive League enter the All University Tournaments and participate in an elimination match to determine the all-campus champions in each sport. Most of ATU intramural events are divided into men's, women's, and co-rec leagues, with men's and women's leagues further separated into green and gold divisions. ATU offers sports including basketball, table tennis, racquetball, volleyball, kickball, dodgeball, soccer, Frisbee, bowling, and softball. Students who excel in intramural athletics may be eligible for university leadership awards. Intramural sports programs at Coker College focus on long-term goals. Intramural activities emphasize the development of positive health and wellness habits through recreational, competitive athletics for students, faculty, and staff. Coker intramurals focus on sportsmanship and social skills, problem-solving, conflict-management, and communication. These activities increase student participation in Coker's campus life. Traditional sports include flag football, softball, and kickball. Nontraditional activities include innertube water polo, pickleball, ultimate Frisbee, and glow-in-the-dark capture the flag. Coker also hosts single-day tournaments in racquetball and disc golf. Coker provides opportunities for students and faculty to educate themselves on healthy lifestyles. The COBRAFIT program offers personalized fitness plans through a partnership between the college's intramural department and the local YMCA. Program participants learn to keep fitness journals and adhere to a workout regimen, which may include intramural sports activities. Concordia University offers intramural programs that promote physical exercise and campus community engagement. These organized sports are also a convenient way for students to take breaks from studying and homework. Concordia students participating in intramurals choose from a full schedule of regular competitions and tournaments, along with open fitness and training activities at the university gym. Intramural sports include volleyball, basketball, tennis, ultimate Frisbee, floor hockey, football, and softball. Students can even participate in a sumo wrestling league. Concordia maintains state-of-the-art athletics facilities, including a stadium opened in 2012. Concordia is also home to the Fellowship of Christian Athletes club, a student-led organization. The Curry College Intramural Department works to enrich the collegiate learning experience and foster appreciation for wellness, recreation, and sports. Curry intramurals emphasize friendly competition, fair play, teamwork, diversity, and integrity. The college offers a variety of leagues and activities for participants of all skill levels. Available sports include flag football, field hockey, powder puff, soccer, basketball, floor hockey, volleyball, softball, and tennis. The Fitness and Recreation Department is located in the student center and provides students access to interactive cardio machines, strength-training equipment, and a group exercise studio. Curry's programs and resources help students create positive, long-term fitness habits. The University of Tampa offers a diverse schedule of intramural sports and recreation activities to students, faculty, and staff. Participants in the intramural sports program can join organized, non-varsity leagues, tournaments, or individual contests, regardless of skill level or experience. The university offers numerous sports facilities, including a new 40,000-square-foot fitness center for both amateur and seasoned athletes. The university offers men's, women's and coed teams in sports including sand volleyball, flag football, indoor soccer basketball, softball, ultimate Frisbee, and team handball. All full-time undergraduate students can participate in intramural sports and use the university's fitness facilities free of charge. Depending on the semester, students choose from 32 intramural sports categories. Millersville University provides flexible intramural programs for students, faculty, and staff. Millersville intramurals include ongoing leagues and one-day competitions for participants of all skill levels. Students use the university's online system to start their own teams or to register as free agents. Millersville's current intramurals schedule includes men's, women's, and coed options in basketball, indoor soccer, dodgeball, and badminton. The university also offers pre-registered and drop-in tournaments in handball, battleship, and racquetball. The university charges a small registration fee for new teams, and students can access scheduling and live updates through IMLeagues. Millersville offers more coed intramural activities than many universities. Each year, thousands participate in Kansas State University's intramural programs. Many teams form from K-State's fraternity, sorority, residence hall, and faculty and staff populations. Participants can also utilize team and player want ads in the Recreation Complex. K-State offers men's, women's, and co-rec activities. Spouses can join, but they must play on the same co-rec team. Faculty and staff are eligible for student-division games and for divisions exclusively for faculty and staff. Available sports include softball, indoor soccer, basketball, volleyball, three-wall racquetball, golf, pickleball, and table tennis. Many intramural activities take place in the Chester E. Peters Recreation Complex, which houses 13 basketball courts, 15 volleyball courts, and a variety of other recreational spaces. K-State uses IMLeagues for scheduling and live updates. Taylor's intramural programs emphasize a holistic approach to student wellness. Participants have opportunities to stay active, socialize with friends, relieve stress, and build character. Enrollment is open to all students, faculty, and staff, along with their spouses. Varsity athletes may not join an intramural team in the same sport they play at the collegiate level, but they may participate in other sports if their coaches allow. Many intramural teams are formed according to dormitory floors, wings, or residence halls. Participation from faculty and staff is encouraged and common. Taylor offers men's, women's, and coed league teams in sports including flag football, soccer, dodgeball, beach volleyball, basketball, softball, tennis, and ultimate Frisbee. League availability depends on student interest level and the time of year. The University of New Haven's RECSports division offers a variety of intramural sports and activities. Students can participate in four-week intramural sessions throughout the academic calendar. The university offers more than 50 intramural programs and organizes tournaments, individual matches, and special events. Catering to amateur, semi-pro, and pro student-athletes, RECSports offers men's, women's, and coed sports including basketball, flag football, soccer, and volleyball. Nontraditional sports include cricket, rugby, and futsal. When the university offers new sports, it sometimes offers a program called "Learn It, Play It!" The program introduces students to largely unfamiliar sports. The university introduced cricket and rugby through the program before adding them as regular intramural offerings. The University of Northern Iowa offers a variety of intramural sports programs. UNI organizes programs that interest students and engage them in fun and competitive physical activity, regardless of their athletic skills or experience. Participants register through IMLeagues, where they can join a team or register as a free agent. Participants must have a valid UNI ID card. The university offers intramural sports including men's, women's, and co-rec flag football, soccer, wrestling, tennis, racquetball, golf, and volleyball. Available sports vary by season. In addition to intramural leagues, the university hosts tournaments in sports including kickball, spikeball, canoe battleship, and ultimate Frisbee. Some leagues require a sign-up fee. Others require teams to pay a fee if they forfeit a game. With pro and semi-pro leagues, Ithaca College offers a variety of intramural programs designed for participants of all skill and experience levels. Approximately 20% of the student body participates in intramural sports each year. IC offers most intramural sports in five- or seven-week men's, women's, and coed leagues. Students can join multiple teams, as long as the teams do not exceed their maximum number of participants and are not scheduled to compete against each other. Intramural sports include field hockey, flag football, outdoor soccer, badminton doubles, and tennis. Spring sports include kickball, pickleball singles, sand volleyball, and video game matches. IC offers nontraditional activities including Quidditch, figure skating, dance, and swimming. IC also has performance and recreational clubs for interests including swing dance, tap dance, step team, yoga, and hip-hop dance. Students must register through IMLeagues. Drew University offers students, faculty, and staff the opportunity to participate in intramural sports including basketball, volleyball, and soccer. Drew's intramurals focus on inclusion to promote equality and opportunity for all students. Drew organizes individual and team leagues, as well as single elimination bracket sports and tournaments. Drew's intramural sports provide stress relief, exercise, leadership development, and social opportunities. Semester-long leagues include flag football, soccer, volleyball, dodgeball, squash, and racquetball. Drew also offers unique activities including "Hunger Games" dodgeball, pub trivia, Quidditch, and billiards. Participants sign up through the intramural sports website. Varsity athletes may not join an intramural team in the same sport in which they play at the collegiate level and may not play intramurals while in-season for their varsity team. Seattle Pacific University provides fun activities intended to bring peers together. The university's intramural sports programs are open to students, faculty, staff, and alumni. Intramurals at SPU are designed to engage participants in athletic activities that broaden their skills and challenge their abilities. SPU offers men's, women's, and coed sports during all semesters. Offerings include basketball, soccer, volleyball, floor hockey, tennis, yoga, table tennis, and ultimate Frisbee. Additional tournaments and special events include a 3K costume run, ultimate Frisbee tournaments, and Zumba classes. Students can receive live updates through IMLeagues. SPU posts regular updates, scheduling information, and photos on social media. 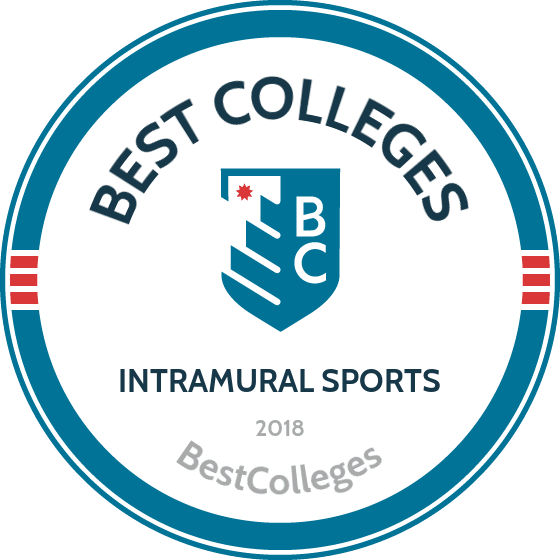 The following 20 colleges and universities have some of the best intramural programs in the United States. In building this list, we considered factors including efficient team and activity organization, appropriate sports facilities, and number and frequency of programs. This ranking also considers each institution's quality of recreational facilities. Some of the schools listed established a trend of providing students, faculty, and staff access to traditional, organized intramural sports. Other schools devote time and energy to revamping their intramural offerings and consistently develop a changing set of leagues each semester. The following institutions maintain organized and exciting intramural sports programs.